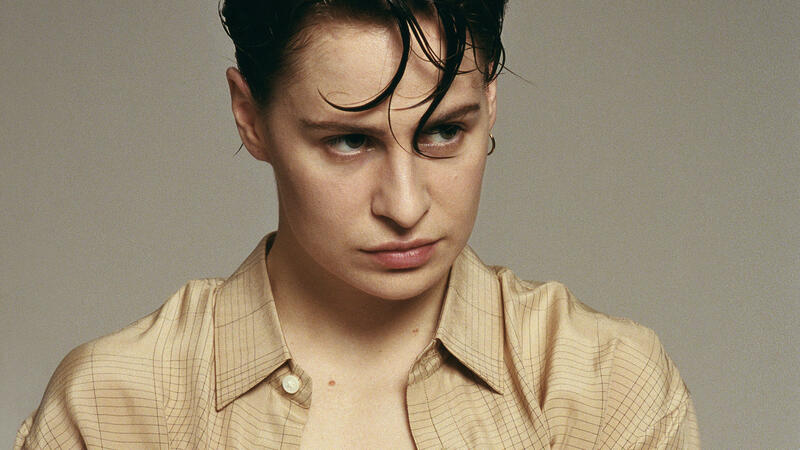 I think Christine and the Queens is one of the most inventive and vital pop artists of our time. She thinks she's "pop music's weird cousin." Either those two ideas aren't mutually exclusive, or we'll just have to agree to disagree. Her evocative and danceable new album Chris explores and blurs the lines between aggressive and vulnerable, masculine and feminine. As with her tremendous debut, Chaleur humaine, released in French in 2014, Chris was produced by the artist herself — and you can feel the urgency in all her musical choices, which can seem as mortally essential to her as oxygen. Born Héloïse Letissier in Nantes, France, she chose the name Christine and the Queens after a life-changing and spirit-saving encounter with drag queens in London. And though that was the name that launched her career, including being named one of BBC's Most Influential Women of 2016, and landing on the cover of Time Magazine as one of the leaders of the next generation, she has no reservations about choosing to cross out a chunk of it and go as Chris. In her World Cafe session, she told me it's "more an affirmation than a negation." That's a telling detail in the life of an artist whose career itself can read as a lesson in affirmation — a case that you can choose what you are, you can change anytime, and anything else would be suffocating. Read more of our conversation below, and listen to the session in the player above. Talia Schlanger: You have such an interesting story and there's so much to talk about together, but first, I don't want anyone to misunderstand or miss the fact that you produced this new album, Chris, as you did your debut. Christine and the Queens: Merci beaucoup. Ah, de rien, no problem. It sounds so tremendous, and I think it's really important to talk about that a little bit at first. Can you tell me a little bit about your recording process for the song "5 Dollars"? Sure, and thank you for asking — it's a pleasure to talk about production. I remember writing "5 Dollars" out of intense listening sessions of Bruce Springsteen. I don't know if it's obvious, but I was obsessed with how limpid Bruce Springsteen's melodies are: It's such a great way to do storytelling and to still be melodic and catchy. I tried to address sparseness as a way to be badass. I wanted to ask you about the lyric that goes, "Then you get five dollars, baby blues." I have a friend who used to live in Paris and he said that "baby blues" is a French expression for the feeling of sorrow you have when something that you've put a lot of work or heart into is over. Is that what it was for you? Yes — when you finish a record and you feel worn out, you could say, "It's the baby blues." There is a French singer called Alain Souchon, and he used that expression to talk about melancholy as a delightful and weird concept. You first introduced yourself to the music world as Christine and the Queens. That name appears on your new album, but everything is crossed out except the 'Chris' part. I should have asked you a while ago, but how should I address you today — as Chris or Christine and the Queens? I actually like Chris more and more. It feels simpler. I know you've talked about this before, but for people who are just catching up on the story, can you explain who Christine and the Queens is? Christine and the Queens is born out of a particular moment in my life where I was quite low. I went to London because I do love that city thanks to my father, [who] is an English teacher. I went back to London on my own and I was kind of searching for something to happen to me: You know, that moment in your life where you feel so vulnerable and you search for something to spark some life back in you, some enthusiasm. I ended up at a place called Madame Jojo's. That night there was a performance of drag queens. It was not new to me — the drag scene and drag queens as a wonderful form of art — but that performance was really liberating to watch, because it was quite rock and roll. There were three drag queens on stage being absolutely reckless. The performance was called "How to Make Rock Music and Cook at the Same Time." They were throwing pancakes all over the place and screaming in microphones. They were just so beautiful in that recklessness that it sparkled something in me. I was a theater kid at that point and I was like, "I should try to use theater to liberate myself. I should use the stage to be as confident as they are." And so Christine and the Queens is not really the name of a band, it's the name of what happened to me thanks to the drag queens in that club. And I decided to make music at that moment. When I think about the music that followed from that experience, and the first song that we really got to know you for, it's the song "Christine" — which came out in French. There's a part in that song where you address the theatricality of what you're doing, and you say, "Je fais tout mon make up au Mercurochrome." What you are singing about here? I was searching for a grotesqueness image that could either be really empowering or be really creepy. The literal translation is like, "I'm doing all my makeup with Neosporin." Mercurochrome is the name of a colored fluid in France to disinfect a wound; it lasts for days after the application because it's kind of reddish. So it was a way to tell a story that could be ambivalent. It's a song that kids usually love: They come up to me and they're like, "I love 'Christine!' " Some adults are like, "This is a really creepy song." They're both right. Maybe kids enjoy it because it's creepy. You said Christine and the Queens was born as a way to cope, and to articulate this life-changing experience that you had. But what you were doing became this really huge thing: You're on the cover of Time as one of the young influencers in 2016 and in BBC's 100 Most Influential Women of 2016. What did you make out of all that success, coming out of this experience where you were figuring out how to be secure? If I'm honest, I have a hard time [receiving] love sometimes. I react better to rejection, and I don't know if it's out of a slight masochist's relationship to the world. Recognition is fantastic, don't mistake me, but in a way, you shouldn't sit on it. I don't like the art to be influenced by that. You've made a huge change visually since then. You crossed the "tine and the Queens" part out of the name and went with "Chris." you also cut your hair. That says to people, "Something is different here." What change would you like to convey with the way you're presenting yourself as an artist now? Things changed, definitely, but it was more an affirmation than a negation. With the process of naming myself and choosing how I'd be empowered with Christine and the Queens, Chris is a natural way to reaffirm that power and that will to be free. I also had to indicate that there was something changing because in the four years between my first record and the one I was writing, I got older as a woman. I got introduced to more confidence, a different way of experimenting and living my desires. I think Chris is way more about that, about living desire as a force of chaos and about reveling in that chaos. One of the ways you play with identity comes through on the song "Girlfriend," where you've said you were exploring ideas of masculinity and what it would be to take on a super-macho identity. What did you learn by going there? Tapping into a more masculine, macho culture, I got in touch with my femininity, but differently. Macho culture is also pride of the body and showing it off — a relationship to theatricality, to construction. It's about owning your narrative again. I feel like I'm being more empowered as a woman on that record than the first one ... which had another interesting relationship to gender, trying to escape gender through becoming more like an abstract energy. I was wearing suits to try to cancel the information of gender. I was trying to escape the male gaze. This time around, I know I can't really escape it. By being a female performing, you are in the male gaze whether you want it or not. So I'm just trying to disrupt it differently. By a lot of accounts, the perspective that you sing about on that song, could be said to be on the fringe. Do you feel like an outsider? Yes, but I assure you it's not a posture. It's just something that — yes, I feel like, in a way, I will never fit in. I used to do a joke a lot in the first tour I made. I was singing a song with a flower bouquet. I took two beautiful flowers and was like, "This is Rihanna, this is Beyoncé." And then I took — you know how in bouquets there are, like, herbs? Just to enhance the flowers, but they're not really flowers themselves. Yeah, the regular green stuff. And I was like, "This is me." And it was just a way to demonstrate how I felt [like] a character also. I would say that I'm pop music's weird cousin. There's a song on the album called "What's-her-face" that kind of addresses the permanence of the wound: once an outsider, always one. Even if, at some point, you get empowered and you belong for some reason, or you find a way to mend your narrative, the wound of feeling totally cast out and lonely and rejected – I think it will forever linger. It never heals, and it actually wakes up, and for me, I do have this experience of the wound waking up regularly. You can't really escape it, you just have to tame it. Dance is a huge part of how we see you in public performance. You're really a tremendous dancer and I can't help but see influence of Michael Jackson in what you do. Tell me about your relationship to him as a performer. I mean, I'm hugely influenced by him. As a dancer, he was incredible: The dance was not decorative, it was just a different way to interpret the music. To me, dance is not decorative, either. I'm not comparing myself — I just have a relationship to dance that feels quite necessary. It's never gratuitous or something that I add on top of a song after the song is written. It actually sometimes helps me finish the song, to think of the dancing. There's another element of Michael Jackson here, too — that he was a shapeshifter and he defied our expectations of identity. I think you have that in common. Is there anything that you've learned about your own career as an artist by observing that aspect of his career? I agree with you totally on the shape-shifting element of Michael being a huge appeal as to why he haunts me. I remember watching a documentary on French TV where they did, like, a morphing of his face when he was a kid to his last iteration, when he was older and totally different. It was like watching someone mutating and altering himself until he becomes what he thinks he is. It's both really tragic and really appealing to me. Touring the first album, I kind of changed. Maybe not super drastically, but my face and my body changed a bit. I remember falling in love with the idea that I would probably announce to myself what I would become by writing a record. Writing Chris, I announced to myself that I'm going to become this androgynous woman who plays with gender a bit more. It's this constant process of emancipation and transformation, and I do love pop artists who got to experiment with that. This feels like a cultural moment where a lot of people are talking more openly about gender and sexuality than they used to be, and there's this perception that our definitions are growing more expansive. But as someone who has been thinking and writing and making art about this topic for a longer time than we've been having public conversations about it, I'm wondering what your take is on this moment. Well, do you want the pessimist side or the optimist one? I think I want both, if that's okay. Optimist side: Wonderful that conversation is happening, or starting to happen. Yes to more representation, and more visibility, and more diversity, and yes to artists exploring more and more, and being more vocal, and less afraid of talking about their sexuality and the nuances. That is wonderful, and that is hopefully opening lots of safe spaces for other people who don't have the chance to express themselves in such a way. But also, I'm really careful about that — that it might become just a trend. When I think of queerness as something that is really important to me aesthetically and politically and philosophically, it's kind of like a form of resistance to the norm, and to a society that digests everything that could be profitable. And I think that we are in a moment where society understands that queer could be profitable. Actually, I had that conversation with people on my first record — they were like ,"Oh, really clever of you to tell [your audience] that you are pansexual. It's a cool mainstream, mediatic thing to do." And I was like, it's way more deep than that, man. I was born and I grew up having to understand what it was to be pansexual. So, you know, I'm both optimistic and pessimistic. For people who have not heard the term "pansexual" before, what does that mean to you? It's just a way for me to defuse the question. "Pansexual" comes from the ancient Greek — you know, the word pan means "everything" — so I'm basically saying I can love anyone regardless of gender information. I don't really believe in binaries; I don't believe men and women are two different poles. I think it's more complicated than it seems. I want to end with the song "Doesn't Matter," because it brings together a lot of the things that make you the artist you are. One is theater — there's a real theatricality to this song. Another is playing with identity in a interesting way. And another one is taking comfort in the group, the way that the vocals are arranged. And they're all you — at least I think that they are, singing with yourself. Yes, they are! It's weird because I wrote it in a place of extreme sadness, but lots of people who listen to it for the first time say to me, "Oh, it's a track about love." And this is why I love [songwriting]: When I decide to write a song, something mends already, in a way. I'm starting to feel more generous again, and resolving things I can't resolve in life. Production assistant Cyrena Touros edited this audio for the Web.